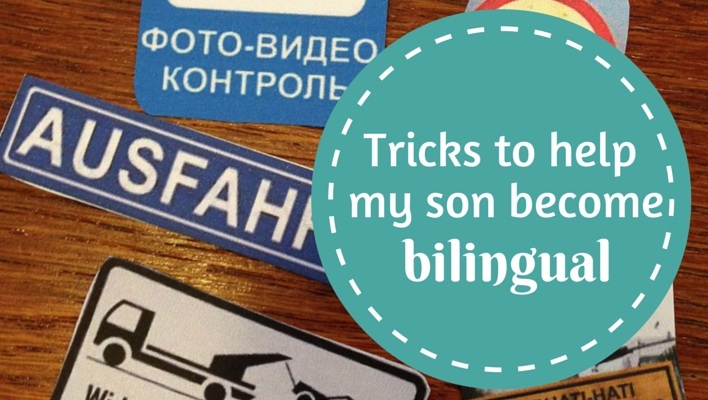 When my son was born I decided I wanted him to be bilingual – his father’s first language is German, and I am reasonably fluent too. I needed to get hold of some great German children’s books. My goal was basically that more than half the books in his book shelf should be German kids’ books. I began buying some German books for babies on a trip to Germany when he was just four months old and then have needed to buy German books online as he’s got older. Finding German books for kids (and especially young kids) hasn’t been easy as it’s difficult to figure out what’s going to be a hit and what isn’t. 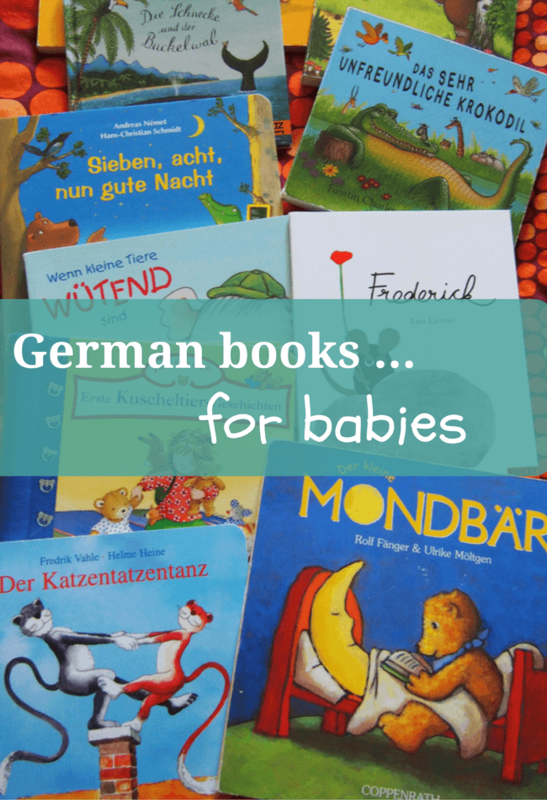 I hope this post helps you find some fun German baby books to help your little German-speaker-to-be enjoy some German stories at bed-time (or anytime, of course!). Wir gehen auf Bärenjagd. (Ab 3 J.). I’m pretty sure that Mein erstes Buch vom Betonmischer (My first book about concrete mixers) is the very first book my son “owned” in German – one that my mother, who was on that first trip with us, bought from the department store in Heilbronn, where I’d lived in Germany. It’s a driveable book – those wheels really work! – which was obviously the attraction. 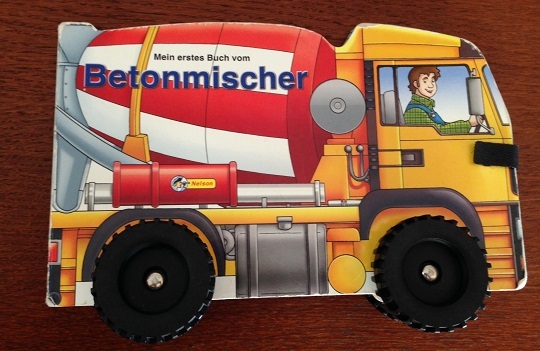 My son’s first German book: Betonmischer – concrete mixer! I still remember so well, sometime during my son’s first year, explaining the contents of this Germaan story book to a friend who’d seen it at our house. It’s pretty dry, I’d said. It just describes where the concrete truck driver goes all day. And then he goes home. At the same time, I was reading my son fantastical fictional English stories like The Gruffalo and in comparison the humble concrete mixer book just didn’t stack up. 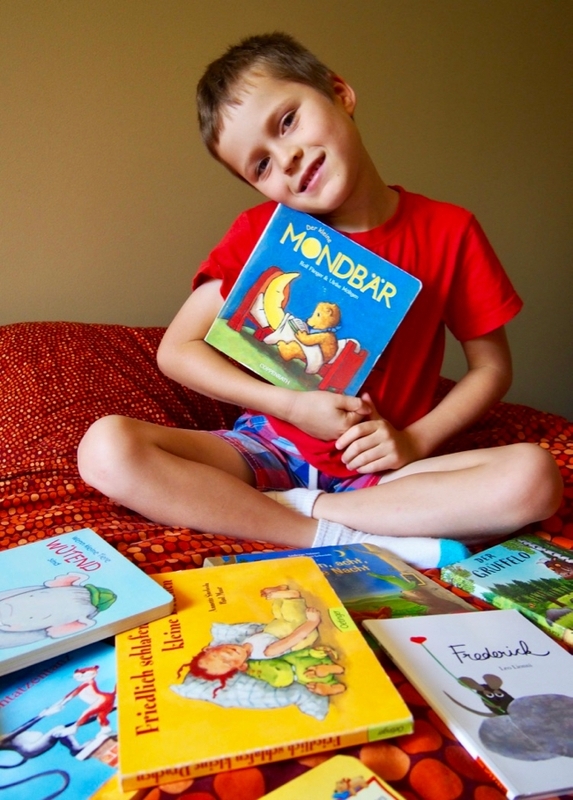 I’m a big reader, and it seems like my son was also genetically programmed to be a big reader. From when he was still a pretty small baby (who didn’t like to sleep) until he was about eighteen months old, these were some of his favourite books. Interestingly he never seemed to notice or differentiate whether what we read were German books or English books – which I thought was a good thing! 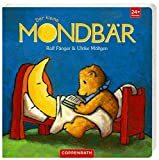 Der kleine Mondbär by Rolf Fänger – “The little moon-bear” – is actually part of an entire franchise, but we’ve only ever had just this one book. It’s about a totally cute bear who captures the moon and reads him stories (one of the few German books we have which is not so heavily based in reality!). This is the only book on the list that isn’t a rhyming book. Abends, wenn der Mond aufgeht (Andreas Nemet – “In the evenings, when the moon rises”) is probably our most read German book of all and I can still recite the entire book. My son always liked (still does) the tabs that you can pull – it’s sweetly done, they make the street lights go out or the moon rise and stuff – it’s a good bed time book. Sieben, acht, nun gute Nacht (also Andreas Nemet – “Seven, eight, now good night”) is another typical bed time book and has a counting element too – it talks about different animals and what they count. Wenn kleine Tiere wütend sind (Eva Muszynski – “When little animals are angry”) is a cute one although probably the least favourite of this list – it’s about animals and meant to guide little ones into what they can do when they feel really angry. Friedlich Schlafen Kleine Drachen (Annette Swoboda – “Sleep peacefully little dragons”) has a bunch of very sweet animals who can all sleep soundly – yes another great bed time book! Kaninchen ist sooo müde and Der Fuchs Sucht Seine Socken (Julia Donaldson/Axel Scheffler – “Rabbit is so tired” and “The fox looks for his socks”) are translations from English and are lift the flap books – short and sweet and my son read these a thousand times each. The six above were probably our very standard, go-to German books that my son would want me to read over and over and over again (as only kids can tolerate …). We also had a more random selection of German books for babies that weren’t always hits but I think are worth mentioning because several of them, I know, are MAJOR hits with other kids – everyone has different taste, right?! 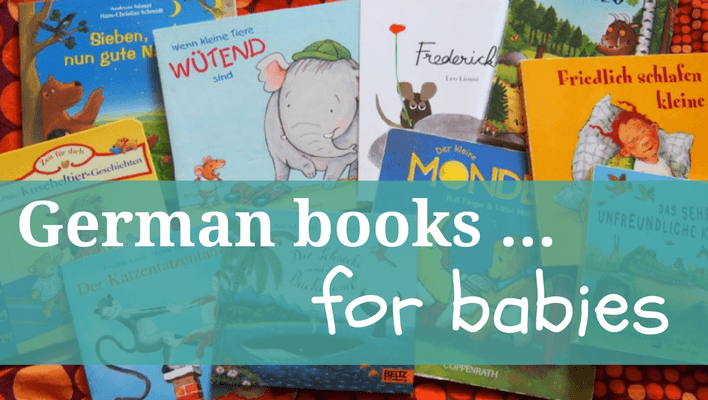 Some favourite and not-so-favourite German books for babies, including some classics! Three of these are books that every English-speaking kid I know has read in English – but for some reason my son never really liked them too much in either language! Der Katzentatzentanz (The cat paw dance – it sounds much better in German!) – short, rhythmic and fun. Wo sind bloß die Ostereier? (Where are the Easter eggs?) – a fun puzzle kind of book which always inspires my son to create an Easter egg hunt for me! Saving the best ’til last: astute readers will have seen I missed out describing a couple of the pictured German baby books in the last section and that’s because they feature here, as books from Rotraut Susanne Berner. I was introduced to her work by my son’s father who said we had to buy one of her Wimmelbuch series (a “Wimmelbuch” is something akin to a Where’s Wally book but not necessarily with stuff hiding – just lots of amazing detailed illustrations and no or few words). Her drawings are simply beautiful and just this morning my son, now four-and-a-half, picked up one of them and pored over it, ending up doing an hour of drawing inspired by the pictures he found there. 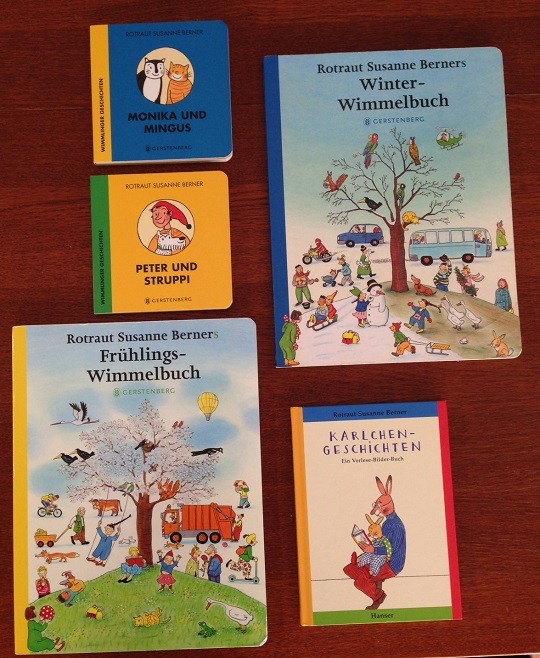 The four-part Wimmelbuch series covers summer, spring, winter and fall and if you pay attention you can follow the stories of numerous characters who appear in each book. There are spin-off books following just one or two of these characters at a time, such as Monika und Mingus or Peter und Struppi . Beyond that, she writes other gorgeous stories with beautiful illustrations, like the Karlchen Geschichten (stories about a little bunny named Karl), which probably belong in the toddler reading suggestions but are here with all my favourite Rotraut Susanne Berner stuff! Do you want to read German stories to your baby? I’m not specially trained in bilingualism or children’s development but from my own experience, my biggest tip is: start how you mean to go on! Don’t think that helping your child become bilingual can wait until they’re “old enough”. It’s so easy just to start reading easy German books to your baby right from when you start reading (which should be pretty much as soon as they’re born, I reckon!). 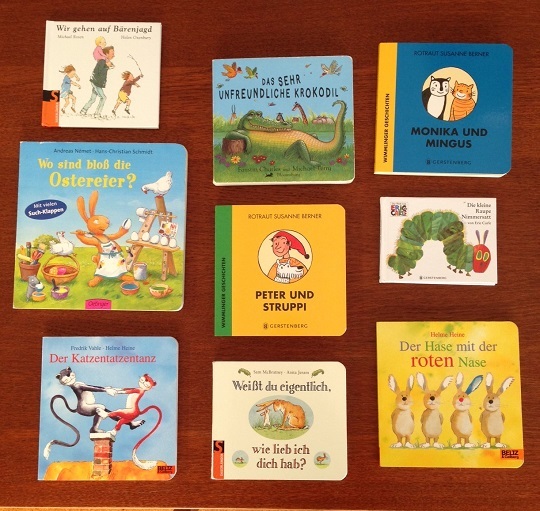 So if you are after some children’s books in German that you’ll enjoy reading to your baby, then start with some of these – or buy them for your partner or a German-speaking family member to read to your baby – and you can’t go wrong. If you have some more good suggestions, please leave them in the comments! I used to live in Germany for a little while directly after high school. I love children’s books in general, but it’s nice to know of some good German options. Thanks! You’re welcome Mikaela! There are some lovely ones. I live with my partner and 16 months old daughter in England but I’m trying to raise our daughter bilingual as well since I am German and my mum still lives there, so my daughter needs to be able to communicate with her. Did you ever do your post about German children’s dvds? Oh no Marina, sorry that those aren’t on Amazon any more – I will have to revise the post! I haven’t done my DVDs post yet (I was just taking photos for it the other day, though) – but my suggestions would include Kikaninchen, Peppa Wutz (Peppa Pig in German – I prefer it! ), Mausi, and as she gets a little older Meine Freundin Conni. Oh lovely! And yes Meine Freundin Conni is still a big favourite here! Must look up Bali!